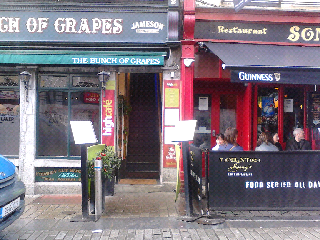 Up a steep-ish flight of stairs above the Bunch of Grapes, this cafe has a stylish-yet-understated atmosphere - classic Irish comfort, not fussy or pretentious. The breakfast menu is small but effective, and served until 12:30pm. Sandwiches come in a wider rage, and they along with omlettes are served until 7pm. 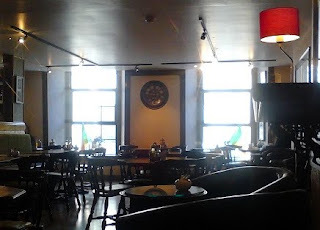 The main menu includes pizzas and a range of very tasty Moroccan main courses - the daytime cafe becomes a very pleasant restaurant in the evenings, and there are a range of vegetarian and gluten-free dishes, clearly marked on the menu. The table are close, but there are a couple of smaller corners if you need to have a quiet conversation. Standard tea / coffe menu, with full table service.